Elizabeth Baptised 2 March 1771 died ? Where did the Parker Duffield come from? At the Dissolution of the Monasteries (1536-39), several fittings were saved from Jervaulx Abbey, which is near West Tanfield. These included the Vicar's Stall wherein there are exquisite poppy-headed benchends, one bearing the hazel bush and barrel (or tun) rebus of Abbot William de Heslington (elected in 1475), made by the Ripon School of Carvers. Nellie Rebecca Heslington was the grand-daughter of Parker Duffield Heslington, 1827-1909 - my great grandfather. She had four brothers: Thomas Parker, Frank Hunter, George Edward and Harry. Her father, Alfred, was the only son of Parker Duffield Heslington to survive to old age. The family lived at Danesmoor, Clay Cross near Chesterfield, Derbyshire. Two members of well-known Danesmoor families, highly esteemed in the neighbourhood, who are actively involved with the Church and social life of the district, were married at the Clay Cross Parish Church on Wednesday, the ceremony being attended by a representative gathering of relatives, friends and church workers. The contracting parties were Mr Claude Parsons, second son of Mr and Mrs Geo. 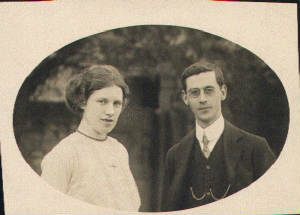 Parsons, of Danesmoor, and Miss Nellie Rebecca Heslington, only daughter of Mr and Mrs Alfred Heslington, also of Danesmoor. The bride's father is a prominent official of the Clay Cross Company Ltd., and for many years has been manager of the Park House (No. 7) Pit. The bridegroom has been confidential clerk to Mr Alfred Slack, solicitor, of Clay Cross and Chesterfield, in whose employ he has been for 16 years - ever since he left school. As a church-worker he has held every post that is open to a layman, and has the Bishop's Licence as a lay reader. He is a representative to the Chesterfield Ruri-deconal and Archdioconal conferences, and has been specially interested in the Clay Cross Mission Churches, particularly of course at Danesmoor, where the bride and her mother have also been active workers for a number of years. Some few years ago Clay Cross possessed an excellent musical union, of which Mr Parsons was the hon. secretary and in which he took a keen interest. Much of the success achieved by the organisation was undoubtedly due to his unflagging energy. The service at the church was fully choral, and was taken part in by the boys of the Danesmoor choir, who have been under the bridegroom's tuition for a number of years. Miss Brakes, T.C., L., was at the organ, and played appropriate music. The officiating clergymen were the Revs. J. L. Blake, vicar, and F. Davis, assistant curate. The bride was given away by her father, and was daintily attired in a dress of cream silk ejolenne, draped with shadow lace and pearls. She wore a picture hat of black Tegal straw, and carried a shower bouquet, the gift of the bridegroom. 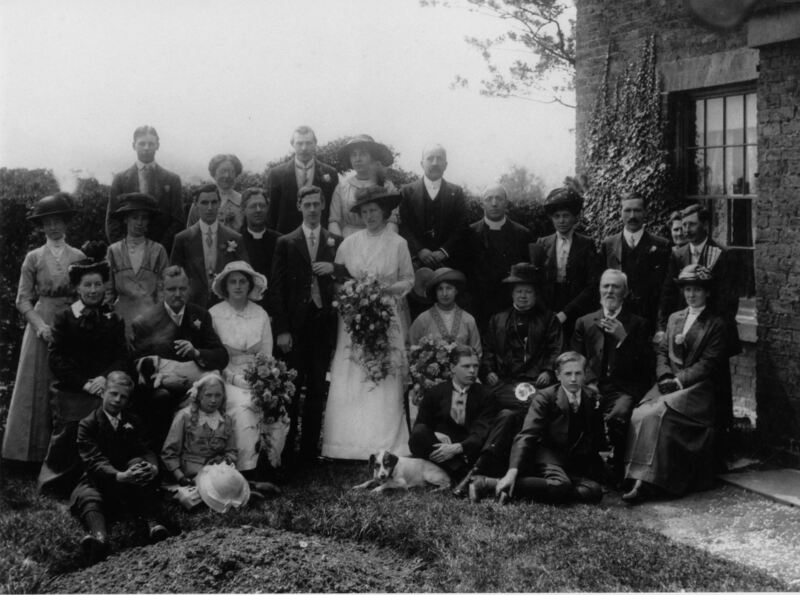 The bridesmaids were Miss Nellie Mellors, of Eastwood, Notts., and Miss Edith M Parsons, sister of the bridegroom, and they also carried bouquets, gifts of the bridegroom. The groomsmen were Mr Tom P. Heslington, of Glapwell, brother of the bride, and Mr George Parsons, Junr., brother of the groom. A reception was held at the home of the bride's parents, and later in the day, the newly-wedded couple left for Bath, where the honeymoon will be spent, the bride travelling in a navy blue costume with hat to match. The bride's present to the bridegroom was a pair of gold cuff links, while the bridegroom's gift to the bride was a solid gold bangle, and to the bridesmaids gold brooches. There was a large number of beautiful presents, including one to the bride of a beautifully chased silver rose bowl from the members of the Clay Cross Park Bowling Club, of which her father is the hon. Secretary, and to whom she has rendered considerable assistance in preparing light refreshments on the occasion of matches. Since starting this page,I have made some very interesting contacts, with Heslington descendants, some of whom are directly related to me!